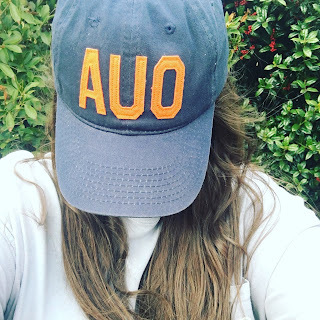 I have to admit, these posts are starting to be some of my favorites-I really love sharing some random updates and favorites with y'all each week, it's been really fun! 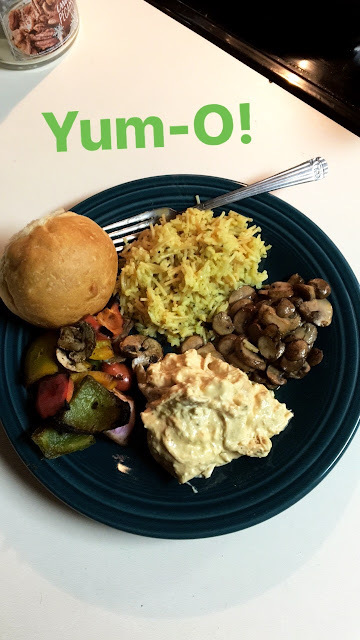 Y'all, number one for this week is just going to be food. First of all, I had oral surgery on the fifth, so last Wednesday & it's been difficult to eat basically anything that's harder than mashed potatoes (it's getting better now, but still) so you know when you can't have something-you want it, right? 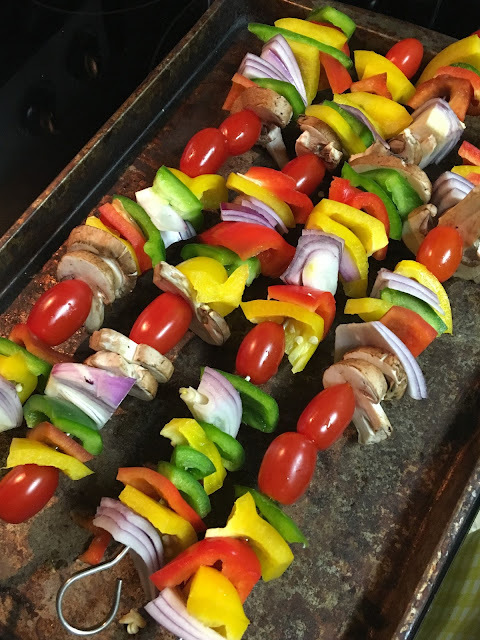 Before my surgery I made these bomb veggie kabobs with shrimp (red, yellow, and green bell peppers, baby tomatoes, purple onion, and mushrooms marinated in a little Dale's sauce and some pepper) and they were amazing. We even ate the leftovers the next day with rice pilaf, water rolls, and "crack chicken". I also made myself some sautéed mushrooms on the side that were divine, but my husband hates mushrooms. Keep in mind, if you make this crack chicken, it's very rich so it's one of those once every three month type dishes! If y'all don't know about my love affair with Tula products, then what are you even doing with your life? If you follow this link you'll get 20% off your first Tula purchase & then you'll be hooked forever. Sorry not sorry! Here are some of my favorite Tula products. . . I had to make a return like two weeks ago and I decided to go out on a whim and pick up this ball cap by the brand Aviate. If you've never heard of them, basically they make caps and shirts, etc. with airport codes of various cities on them. You can look at all of their places and stuff here. Guys, if y'all have Chick-Fil-A nearby, I suggest you run and try their Cobb salad asap. (With a frosted lemonade on the side). It's not the most healthy salad, but it's so good. It's a healthy-ish treat & since I rarely eat fast food, I'll allow it for myself! It's a delicious combination of lettuce with tomatoes (and all the other salad toppings) and if you really want it to taste amazing, add the garlic & herb ranch. All of that with their chicken nuggets sliced on top. Basically heaven. I smelled this perfume the other day & now it's on my wishlist. It's the perfect romantic, feminine scent and I'm in love. Victoria just shared Aerin Lauder's new line for William Sonoma on her blog and I'm dying over the pretty light details for Spring! Speaking of home design/decor...have you looked at Target's new spring line? I'm obsessed with everything. Who is as obsessed with Amazon as I am?! If you haven't heard, now they've got a "Something in, Something out" program & it's the best idea ever. I recently discovered that you can order my favorite Talenti gelato flavor in bulk on Amazon and my life has pretty much changed dramatically. If you were wondering how my April Goals are going, this was my view today on my walk! Our neighborhood is perfect for walking in and the weather was awesome today so I took advantage of not having to drive to the park. 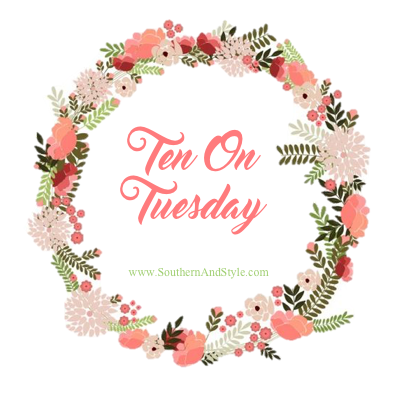 Well y'all, that's all for this weeks Ten on Tuesday-let me know what you're up to this week below! I love love Chick-fil-a! It's a little bit of a guilty pleasure, especially the waffle fries with chick-fil-a sauce. I'll have to try the cobb salad! Those kabobs looked amazing! I do love me a little Chick-fil-a although I'm trying to eat healthier these days! Hope you are feeling better after your oral surgery.